on electricity. " D" battery power. or by hand .. you can sew anywhere . 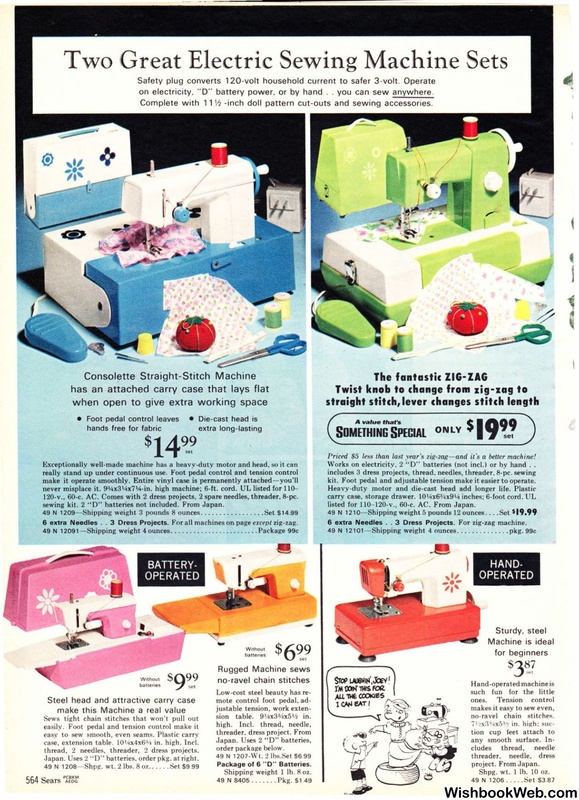 Complete with 11 1h -inch doll pattern cut-outs and sewing accessories. 120-v., 60-c. AC. Comes with 2 dress projects. 2 spare needles, threader, 8-pc. sewing kit. 2 " D" batteries not included. From Japan . t hread, 2 needles, threader, 2 dress projects. .Japan. Uses 2 "D" batteries. order pkg. at.right. 49 N 1208- Shpg. wt. 2 lbs. 8 oz. .
Package of 6 "D" Batteries. Shippin g weight 1 lb. 8 oz. Priced $5 less than last year's zig-zag- and it's a better machine! Works on electricity, 2 '' D" batteries (not incl.) or by hand . .
kit . Foot pedal and adjustable tension make it easier to operate. listed for 110- 120-v., 60-c. AC. From Japan. 6 extra Needles .. 3 Dress Projects. For zig-zag machine. Shpg. wt. 1 lb. 10 oz.